Every Japanese particle has many purposes and uses, and we did not have the time in that article to cover the uses of each particle completely. 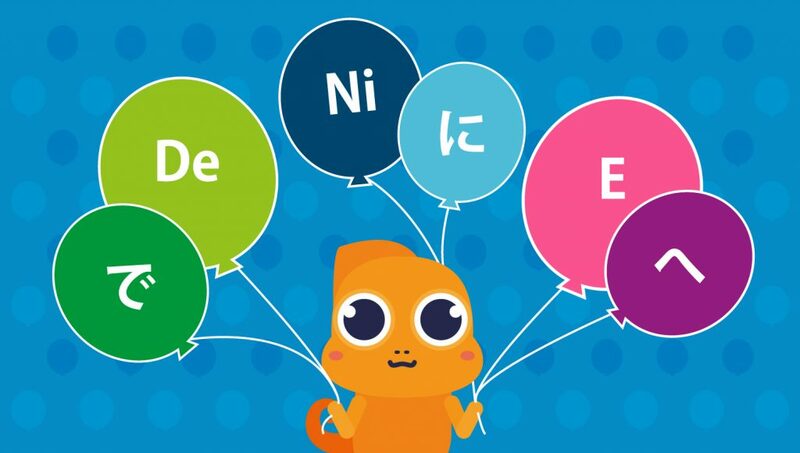 So, beginning with our article on “How to Use Japanese Particles の(no), よ(yo), ね(ne), and か(ka) in the Endings of Your Sentences“, we will continue with Japanese location particles で(de), に(ni), and へ(e). We will be doing a series of particle articles (how many times can you say that in a row?) that go into depth on the uses of three to five particles at a time. I read books in the library. で de is also used to indicate the tools or means by which an action is done. This tools or means can be an implement such as a pencil, a vehicle such as a train, a body part such as one’s eyes, and etc. I touched it with my hand. You will sometimes also see で de placed after nouns or na-adjectives, in which case it means “and.” Note that this is done with na-adjectives but not with i-adjectives. Kawa-chan is energetic and cute. 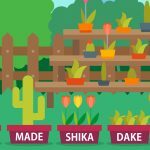 (Remember, “genki” looks like an i-adjective, but it is a na-adjective (“genki na”) – the “na” may not appear in a sentence, depending on the grammar patterns used in that sentence). Kawa-chan is diligent, and studies every day. However, be careful of using で de to mean “and” – there are many ways to say “and” in Japanese, but their usages are more particular than the word “and” in English. に ni is one of the most multi-purpose of particles. 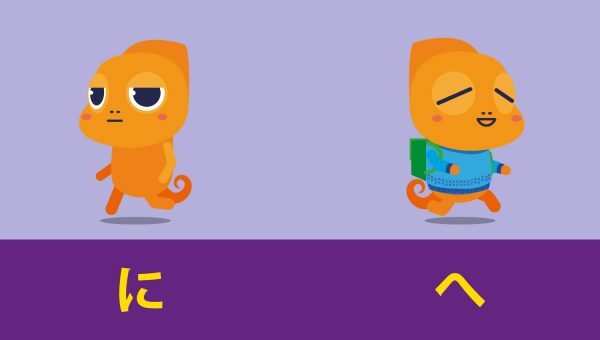 We will not be able to cover all of its uses in this article, but we will try to go over enough of them to give a well-rounded picture of に ni. Generally speaking, に ni encompasses meanings such as “at,” “in,” “on,” and “to.” Because it can mean so many different things, you will find multiple に ni particles in a single sentence more frequently than you will find multiples of other particles such as は wa or を wo in a single sentence. I am living in Tokyo. I am working in Tokyo. A good rule of thumb is that while both particles can mark the location where a verb occurs, で de tends to be used when the verb is an action, and に ni tends to be used when the verb has more to do with just being or existing. 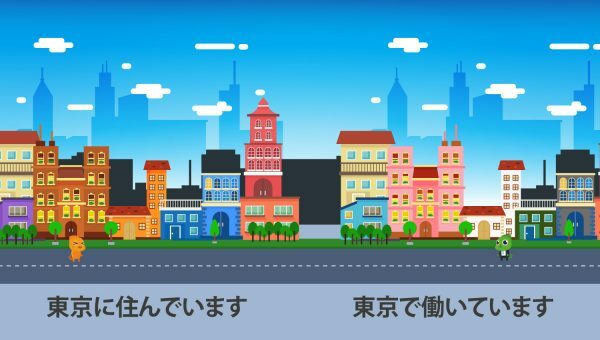 If sentences with verbs like あります arimasu [to be (for things)], います imasu [to be (for people/animals)], 住みます sumimasu (to live/dwell somewhere), or 泊まります tomarimasu [to stay somewhere (temporarily)] have a location word or phrase in them, the location word or phrase will probably have a に ni after it. に ni can be used with certain time words to indicate when something occurs. As a rule of thumb, に ni is used with words that indicate a specific time (such as two o’clock, Monday, or June), but not with words that indicate nonspecific time periods (such as today, next month, or every evening). Kawa-chan goes to school at 9:00. Some verbs must be paired with に ni rather than with the object particle を wo. 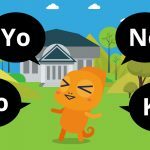 Most verbs to do with motion (to go, to run, to return, etc) are paired with に ni, and most verbs that would be paired with words like “to” or “on” in English are paired with に ni (to sit, to get on [a vehicle], to go in, etc). In sentences using verbs of giving or receiving, recipient people are marked with に ni. Below are a few examples. I ran to the station, and got on a train. I sat in a chair, and called my friend. Kawa-chan gave her friend a present. When used as a particle, へ (“he”) is pronounced え (“e”). 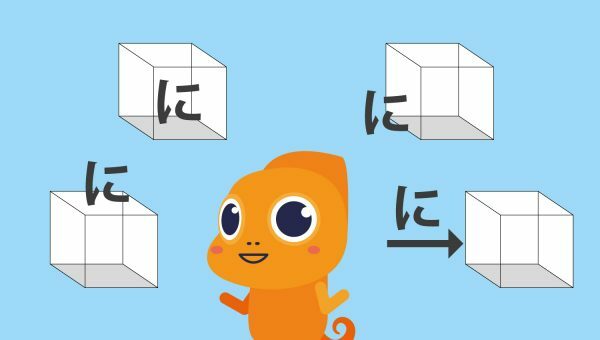 へ e is similar to に ni in that it is used with verbs of motion. However, it has a more poetic nuance to it than に ni does, and its use is very limited compared with に ni. Use with verbs of motion is only one of に ni many functions, but へ e is used with verbs of motion and little else. 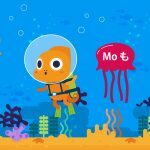 Most sentences with a verb of motion and に ni can use へ e instead with little change in the sentence’s essential meaning. However, while に ni is a rather utilitarian word, へ e has a more vague and/or expressive sound. Watashi no machi e youkoso! Because of its somewhat poetic nuance, へ e is often used in the titles of songs, movies, comics, or novels. In titles, へ e can be used to indicate giving or conveying something to someone (often with no verb attached), as well as motion toward a place. In titles, へ e can also indicate figurative motion, such as toward a goal. For example, 花盛りの君たちへ hanazakari no Kimitachi e (For You in Full Blossom) and テラへ… tera e… (Toward the Terra) are the titles of two manga series (published in the 2000s and the 1970s, respectively), and 最強への道 Saikyo e no Michi (The Path to Power) was the title of one of the “Dragon Ball” movies. That’s everything on で de, に ni, and へ e for now! If you have any questions about these particles, or if there are any uses of these particles that we neglected to go over in this article, please leave us a comment below!